Having spread a “beautiful story” of revived vineyards and improved quality over the past 30 years, Greece is now at a crucial turning point in its development, according to one key winemaker. 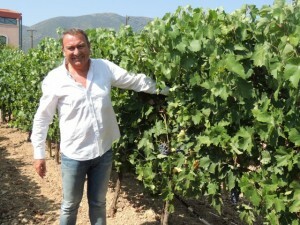 Speaking to the drinks business on a recent trip to the region George Skouras, founder of Domaine Skouras, said Greek wines are now “very competitive”, but that the next step was to produce an “icon wine” to further build the country’s reputation in international markets. George Skouras founded Domaine Skouras, in the Nemea PDO region of the Peloponnese, in 1986 having returned from studying oenology in Dijon, later working in both Champagne and Italy. Recalling the progress made in the last three decades by the Greek wine industry, Skouras said winemakers such as himself, who had studied abroad and later returned to Greece to set up their own wineries, had a big influence. “All the old guys like me got to know each other and started to worry about the Greek wine industry and organise things and produce things together, which was nice because it was not just competition but co-operation to promote Greek wine”, said Skouras. “Now, after seeing a real revolution in Greece’s wine industry, we are very proud to have around 1,000 commercial wineries in Greece, (up from just 70 in the early 80s) and I personally would be happy to see 3,000 wineries in Greece. Now there are enough beautiful wineries that can show the richness of Greek varieties”. In Nemea the Greek variety of Agiorgitiko (pronounced Ah-yor-yee-ti-ko), a polydynamic red variety capable of producing wines from a very light rosé to barrel-aged full-bodied reds, reigns supreme. Often blended with international varieties to increase its familiarity with international consumers, Skouras used a blend of Agiorgitiko and Cabernet Sauvignon to produce his first flagship red, Megas Oenos. While one of the most widely planted varieties in Greece, its pronunciation is perhaps the most challenging of all Greek grapes, which prompted Skouras to change its name to “St George” in some markets to make it easier to sell. Of its potential to grow on the international market, Skouras is confident. Skouras began exporting his wines from the beginning and now maintains a 50/50 split between domestic consumption and exports to the rest of the world. Half of those exports are to the US, followed by Europe, and a little bit to Australia and China. Indigenous varieties account for 90% of its production, with international grapes making up the remainder. Eight medals for Domaine Skouras winery – Thessaloniki International Wine & Spirits Competition 2016!